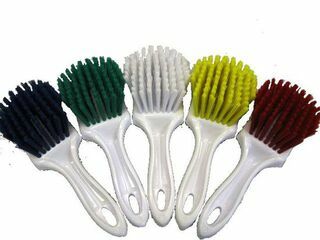 Gong Brush filled in coloured polyester with a long plastic white handle. Ideal for use in hot water. Food hygiene quality. Available in a variety of colours, please see drop down menu. 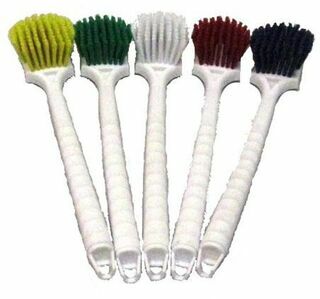 Gong Brush filled in coloured polyester with a short plastic white handle. Ideal for use in hot water. Food hygiene quality. Silver Toilet Brush Set. Plastic. Set includes holder and brush. 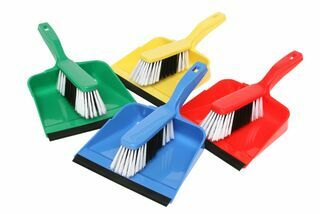 Stainless Steel Toilet Brush Set. White Toilet Brush Set. Plastic.